Daniel-Constantin Mierla co-founded in June 2005 Kamailio (formerly named OpenSER-Project.org), aiming to build a solid SIP server project where openess to community and contributions has an important role, previously being core developer of SIP Express Router (SER) from its early beginning in 2002. He has a Master degree in Computer Science and Engineering from the Polytechnics University of Bucharest. His experience was accumulated working as consultant for Orange Romania, branch of French Orange mobile operator, and researcher in network communications at Fraunhofer Fokus Institute, Berlin, Germany. Among his goals with Asipto company is to build reliable services and solutions that benefit at maximum from Kamailio’s flexibility and features, sharing his knowledge and expertise via professional trainings and consultancy. Daniel is a frequent speaker at SIP, VoIP and Open Source events, advocating Kamailio (OpenSER) and SIP Router projects while still being very much involved in development and community activity. He authored many of the available tutorials, like Devel Guide, Integration with Asterisk, Radius Integration, the Cookbooks for Core, Pseudo-Variables and Transformations, Step by Step Installations from SVN or GIT. 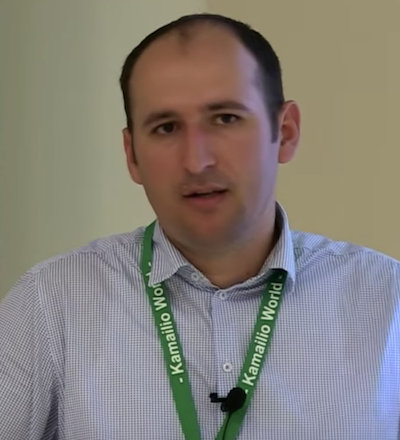 He is one of the main organizers of Kamilio World Conference and co-author of the book named “SIP Routing with Kamailio“.